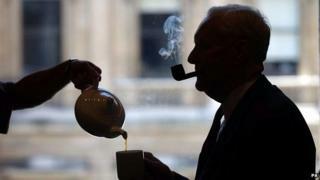 Late each night, Tony Benn would sit alone and dictate on to tape his account of the daily events at the heart of the government. Keith Jones, who turned the recordings into two series of The Benn Tapes on BBC Radio 4, looks back on a political career that has been documented like no other. I was in the basement of Tony Benn's house, listening to one of his scratchy cassette tape recordings. I could scarcely believe what I heard. It was the sound of Harold Wilson, rising to his feet in 1976 to make a private speech as serving Cabinet ministers cheered and banged their cutlery on the No 10 dining table. It was of course Wilson's farewell dinner with them. I could almost smell the remains of the poached salmon in the atmosphere. Tony would describe the speech itself as "boring" when he came home to dictate his entry that night. But in truth the compelling immediacy of the atmosphere it records punctures across the years. For many years, Tony had been dictating his nightly accounts of each day's events . Everywhere he went, he took his miniature tape recorder and usually captured much of what went on. To mark his death, BBC Radio 4 is broadcasting Tony Benn's 2003 recording of Free At Last: The Benn Diaries 1991-2001. He was, in effect, building what became his own personal archive, filling a gap between, as he put it, contemporary journalism and history. Not even Richard Crossman, Alan Clark or Barbara Castle's diaries could boast the accompaniment of real soundtracks of the life experienced by a serving cabinet minister in the 20th Century. Highlights from the tapes include his angry description of a ceremony to mark the first North Sea oil coming ashore in 1975 - how the Queen is paraded before the oil workers, who are kept from her behind pens as if he, she and they were in a zoo. Then there is his recording of a very "relaxed" Jim Callaghan and others from across the Labour party and trade union movement singing together, but badly out of tune, at a private party following the annual Durham Miners' Gala. Tony's diaries effectively became a political franchise, as new volumes appeared regularly under the skilful and accomplished editing of Ruth Winstone. There were millions of words, dictated randomly and often chaotically late at night, faithfully logged and transcribed by assistants, some of them affectionately known by this prolific tea-drinker as the "tea bags". One night he fell asleep in the middle of recording. On another tape I heard the speech speed up comically and wondered what had overcome him. Until we realised the batteries had been running down as he spoke, so the recording tape moved ever more slowly without him realising. An experience probably unheard by younger people of the digital age. Why did he do it? It wasn't pure vanity. He wanted to keep an accurate record of his time witnessing many of the most important events and government decisions. He was meticulously accurate and when I checked, his entries correlated with the record of other ministers' diaries who had also been present and recorded their own accounts. How could it be otherwise? He was scathing of memoirs penned after the event ("sanitised rewrites made years afterwards") and thought diaries the only reliable records of events. As he pointed out, his dictations were mostly made the same or next day, transcribed and could not then be rewritten after the event. They record the sheer exhaustion of combining constituency and ministerial responsibilities, familiar to British MPs to this day. One entry in the small hours of the morning describes some of the problems he's tried to help people with in his weekly surgery in Bristol. And how he worked from 09:00 to 02:30 without a break after an exhausting ministerial week. Media captionTony Benn: "I can't make this campaign out... such a gap between the top and the bottom"
On the way home from Wales during the 1978-79 winter of discontent, he describes his cabinet colleagues as despairing and fed up, with Jim Callaghan contemplating giving up the leadership as the government neared the end of its life and the dawning of the age of Margaret Thatcher approached. Years later, after Labour's fourth consecutive defeat in 1992, he muses in the small hours of the morning on his alienation from Westminster politics and the need to reconnect, campaign and influence people for change. From 1992 onwards he continued his campaigning and influencing, and a steady stream of diaries appeared along with the recordings, transmitted on BBC Radio 4. They reveal, in all their chaos, the daily and messy life of a committed politician with its exhausting highs and lows. There are glimpses and cameos of great people, recordings of extraordinary events and moments of high political drama. Media captionTony Benn: "I felt as though I was a slave to Rome"
Despite fiercely opposing her, he admired Margaret Thatcher because she stuck to her beliefs. He saw her as a teacher and was himself one, as others have commented. But he was more than a teacher - he was an enabler, a persuader and he sought to shape politics on the left, which he undoubtedly achieved. Throughout this shines the bright and attractive personality of a man rooted deeply in his family, and in his beliefs of equality and democracy. And who was so charming that I have always regretted the day I ceased to have reason to work with him. Media captionTony Benn: "Wilson has betrayed the Labour government"
Historians and ordinary people will, if they look, find much more in his archive and in the record of his life - whatever they think of his politics. His passing is of course the end of an era. But it is one which has been richly recorded, as no other before it.